We are excited, but also a little sad to hear that for our friend Barbara is retiring this year. Barbara has worked for Sam’s Club fundraising for Children’s Miracle Network for 25 years! It is only fitting that she retire on the year that we celebrate 30 years of partnership between Sam’s Club / Wal-Mart and Children’s Miracle Network. 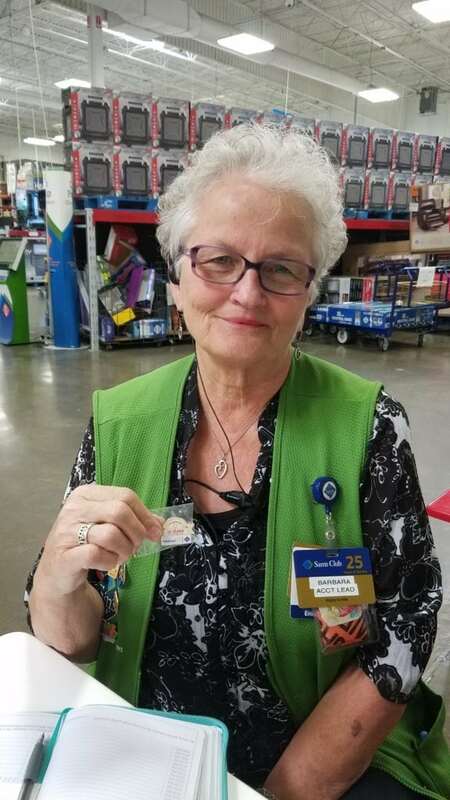 Barbara proudly posed for a picture holding up her 30 year celebration pin. We are so honored to have been able to work with Barbara these past 25 years. She has been a wonderful champion for this cause and we feel fortunate to have been on her team. Thank you Barbara for all that you have done. You have made a world of difference in the lives of so many children. Previous post: Miracle Mom talks about being the mother of a Champion.